It’s not often that I get to combine my two favourite pastimes: bird keeping and cycling. The retirement yesterday of Alberto Contador, the most exciting grand tour rider of this century, gives me that opportunity. Famed for his panache, Contador won the Tour De France twice, the Giro d’Italia twice and the Vuelta a España three times. He finished off his career on a high, both metaphorically and literally. 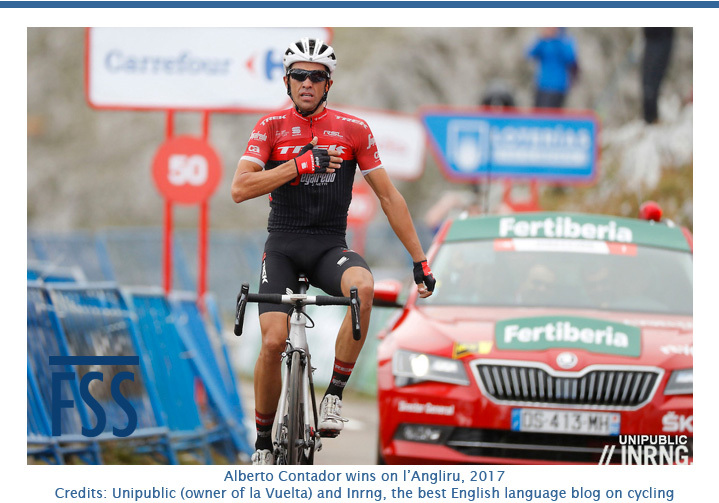 He not only won the hardest stage of the 2017 Vuelta, which finished atop l’Angliru (1), but he also did it in style, attacking Chris Froome and his Sky team on the previous descent and then climbing clear to the finish. Alberto Contador is popular amongst cycling fans because of his heroic attacking style; there aren’t many like him. Adiós Alberto! Cycling’s loss could be bird keeping’s gain. Alberto’s other hobby is canaries; sadly not Lizards, but coloured canaries. I don’t know if he exhibits his birds (can one of my Spanish readers confirm?) but instead of winning in the Alps and Pyrenees, could we see him winning gold medals at the World Show (2)? Hola Alberto! l’Angliru is a famous mountain climb in Northern Spain. It rises to 1573 metres above sea level (that’s a mile high) at an average gradient of over 10% peaking at almost 24% (1 in 4). It is one of the most feared climbs in professional cycling. Yes I watched and you are spot on all these years I enjoyed his achievements funny thing anything Froome has done I for one reason or another think nothing of it I wonder why. I wonder if Alberto had a good team around him organised what could he have achieved over the years. Something tells me this is not his swan song for I have a feeling he will be cycling in the tour in 2018 reminds me of our own Sean Kelly a good clean sports man. Yes, Kelly one of the cycling greats, but not a bird man, so doesn’t qualify for this blog. He might have a parrot ?? ?>?